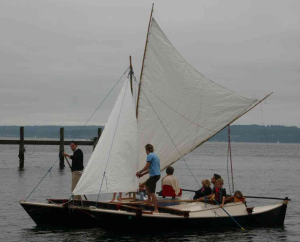 Since the launching of our Wharram Tiki 21, Milagra, back in the summer of 2012, we have been propelled primarily by an oceanic lateen, or “crab claw” main sail. 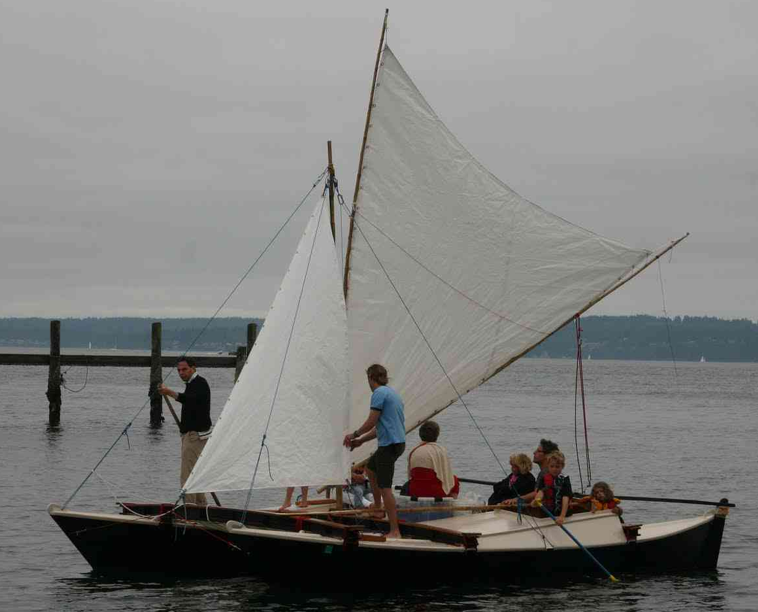 We’ve tried a small (7.5 m^2) version and a bigger (13 m^2) version, both made of white polytarp laced to bamboo spars. 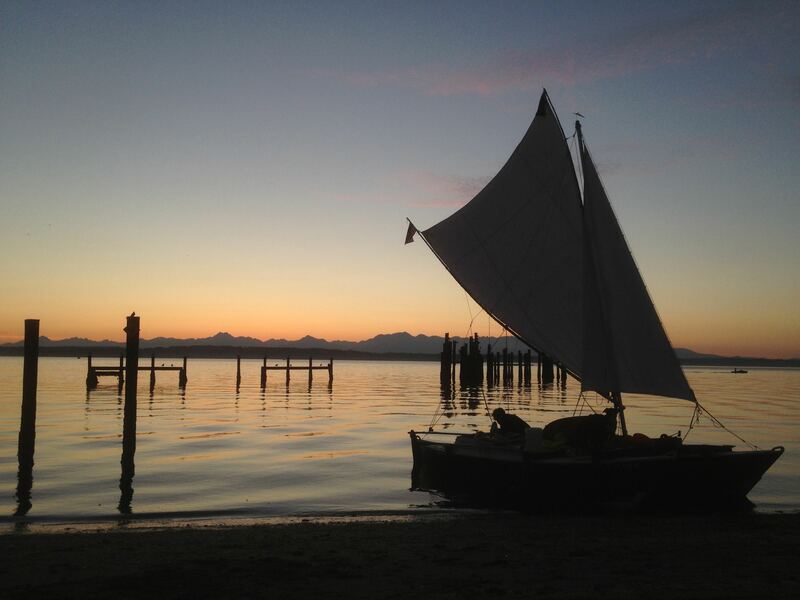 We’ve tried them with and without a jib, on a 13′ bamboo mast and a 20′ aluminum mast stepped at the center of the main beam, between the main and forward beam, and on the forward beam. 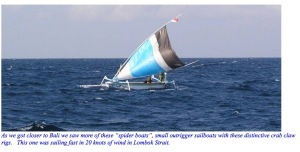 The 7.5m2 Dierking crab claw and a little jib hoisted on a 13′ Tonkin bamboo mast stepped on the main beam. The 13m^2 Wharram crab claw on a bamboo stub mast (bowing even after reinforcement with basalt sock!) stepped on the forward beam. The 13m^2 crab claw and a jib supported by a 20′ Aluminum tube mast stepped on or just forward of the center beam. 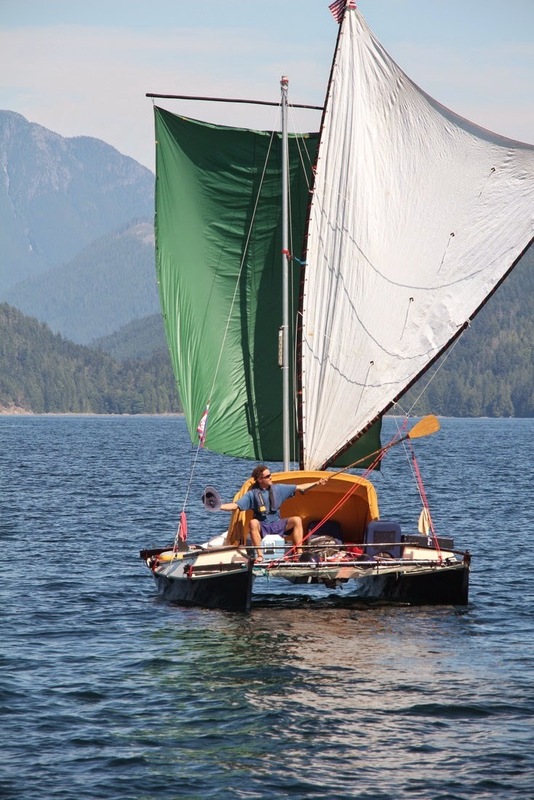 Running into Desolation Sound under the 13m^2 crab claw and a squares’l fashioned from a 10×16′ tarp and our 13′ oar hoisted on the jib halyard. 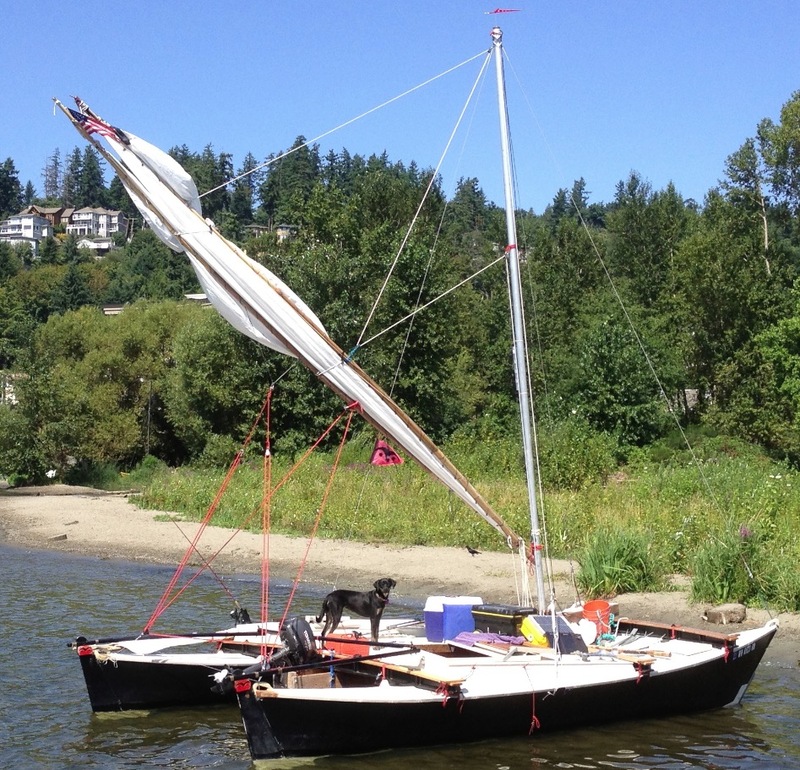 A second pleasant feature is that the rig works quite nicely with only 2-3 control lines: a halyard, a main sheet, and optionally a snotter (for controlling the tack — whether it’s allowed to go forward of the mast or fixed on the mast and hoisted or lowered). 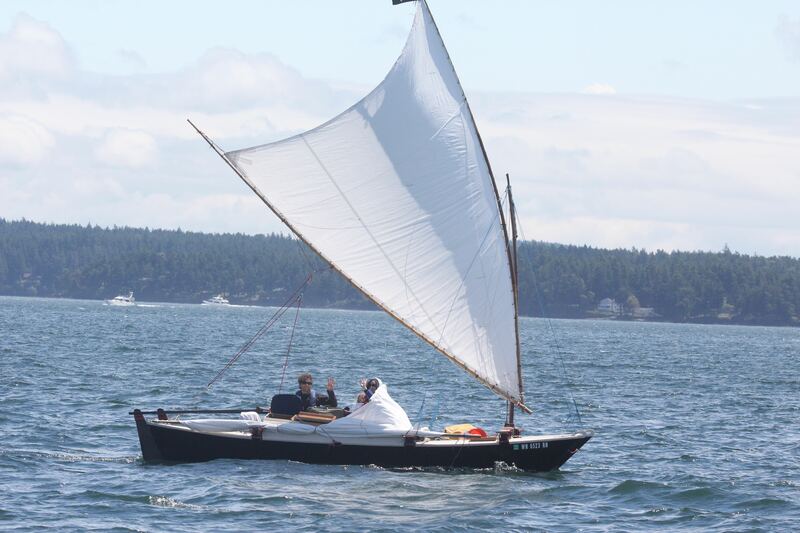 Well, to be honest it’s actually 3-4 lines because — inspired by Hokulea — we have gravitated to dual mainsheets running from the sterns because they can be used to control the sail shape without having a traveller (and thereby adding 2 additional lines to a single mainsheet). 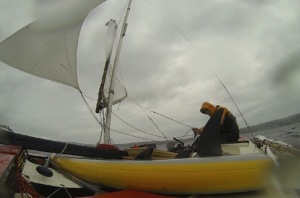 Or maybe it’s 5-6 if you count the brailing lines for pulling the yards together when furling the sail. 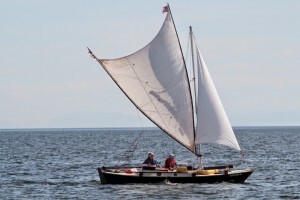 The photo above shows these lines when the sail is furled. 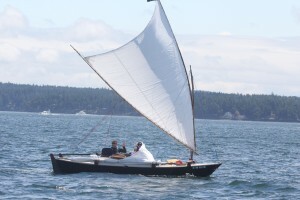 In the photo below you can see the snotter and the dual mainsheets in action. The sheets are attached to the outer part of the spar and a SS carabiner on a bridle to spread the load out on the lower spar because we broke the bamboo when the sheets were attached directly to the spar (at a single point). 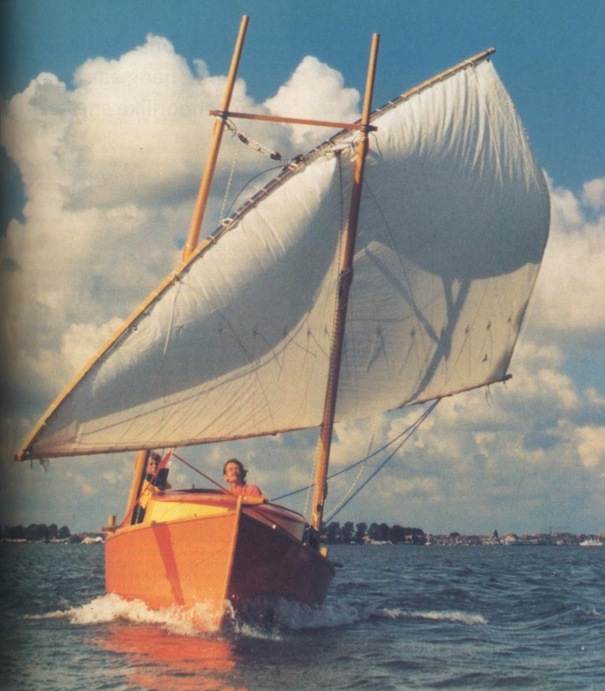 You can also see the brailing lines zig-zagging between the upper and lower spars. 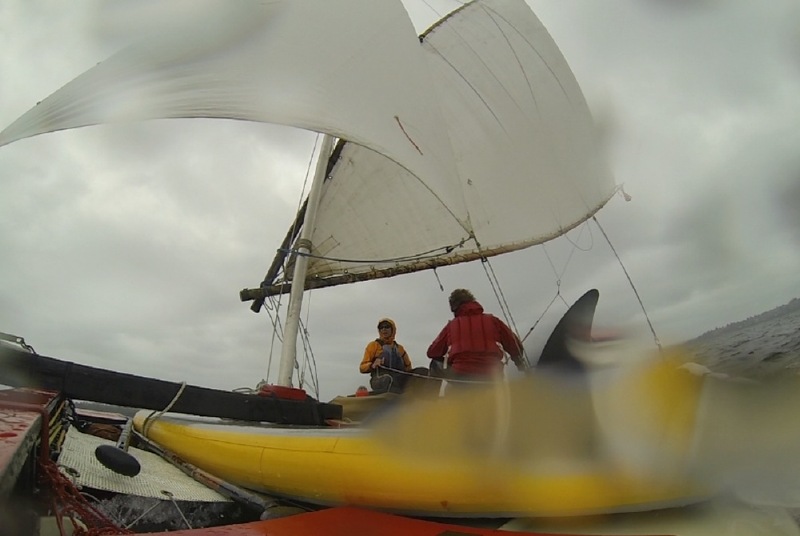 GoPro frame of the bamboo-polytarp crab full on a close reach from the leeward side. 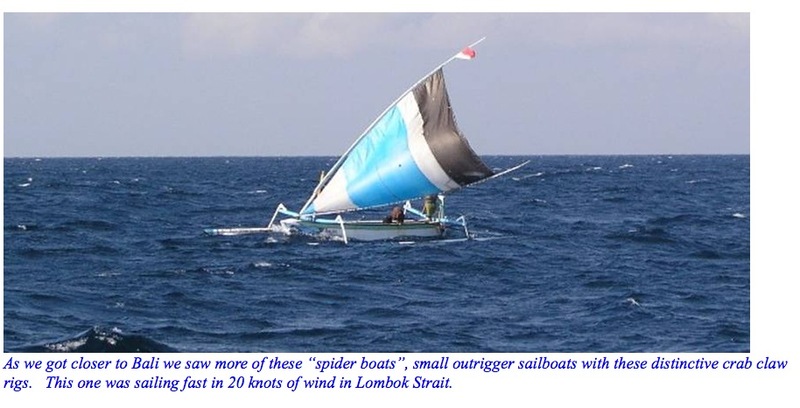 Another admirable feature of the crab claw’s bamboo spars is that they taper towards the end and therefore bend more, allowing the sail to spill wind out the top during gusts. In another frame from Thomas’s GoPro (below) you can see this happening. GoPro frame of the crab claw spilling wind on a beam reach. So how does the crab claw perform? Here is the analysis with GPS Action Replay of data taken during a two test-sails on Lake Washington (minimal waves and no tides). 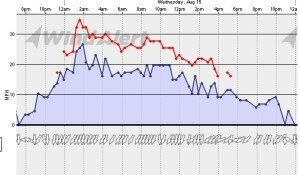 The first was from about 1-5 p.m. on 15 August 2012 in a light northerly (~10 knots steady with gusts to 15 or 20). 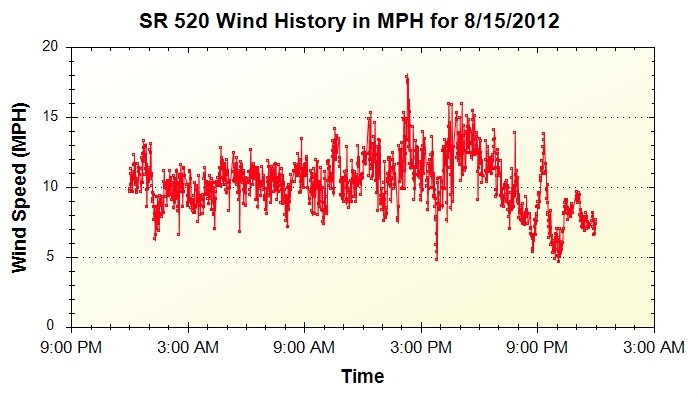 These two plots show the wind at Sail Sand Point and at the 520 bridge — points that bound the area in which we were sailing. 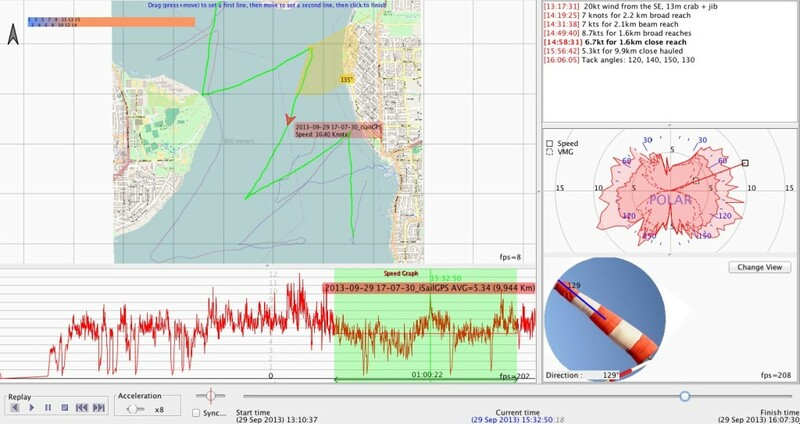 Our tacks suggest that the wind was backed by the topography of the lake shore near Sand Point to be more out of the northeast. 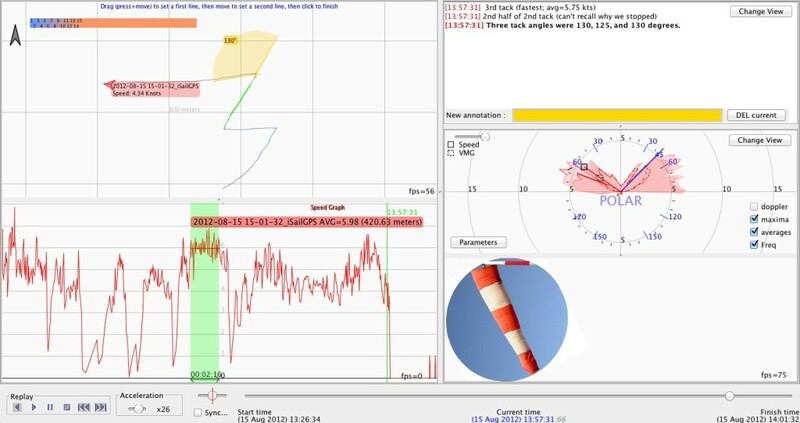 Mostly we were tacking through 130-140 degrees (maybe 125 once). 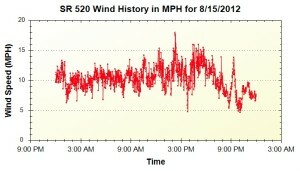 We were going about 4-5 knots when close hauled and 6-7 knots when reaching. Momentary top speeds were 8-9 knots. 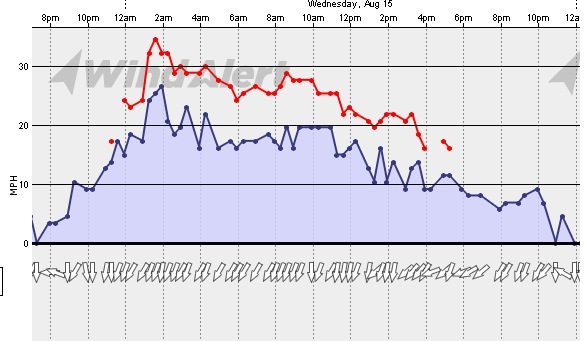 20-15 knot steady northeasterly wind during our afternoon sail. In this higher wind situation, we were tacking more erratically, but still through about 130-140 degrees. 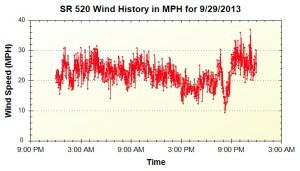 We were going a bit over 5 knots when working up wind close hauled and 7-8 knots when reaching. 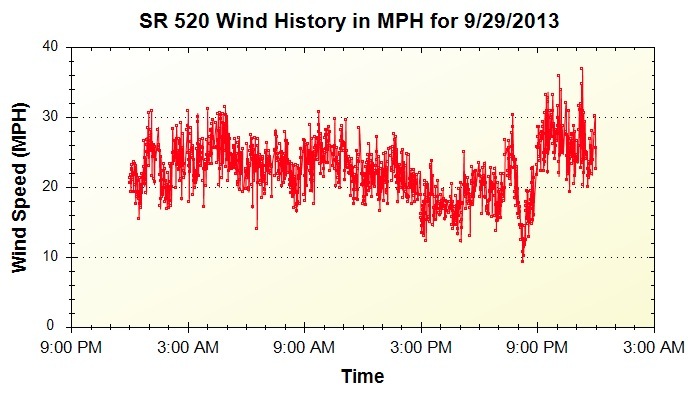 Top speeds were over 9 knots for extended periods and as high as 10-12 knots a few times (mostly on broad reaches at ~140 degrees off the wind). 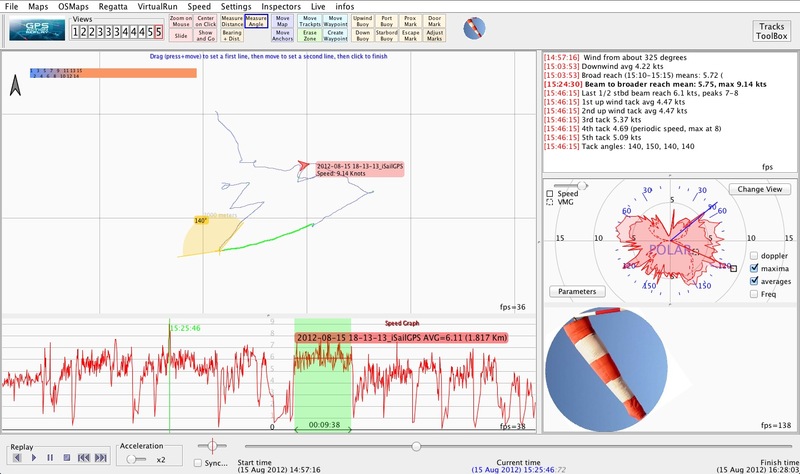 Use pieces of video tape (along with soap bubbles) to track airflow as suggested in crab claw tests. Bipod mast to get smoother air flow? A crab claw suspended from an H-shaped double mast in Holland! 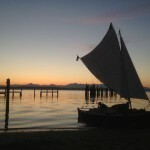 Raking the sail much further back (especially in high winds?) while keeping tack up near the bow.